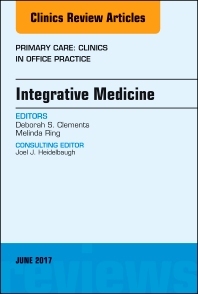 This issue of Primary Care: Clinics in Office Practice, guest edited by Drs. Deborah Clements and Melinda Ring, is devoted to Integrative Medicine. Articles in this issue include: Introduction to Integrative Medicine; Phytotherapy; Lifestyle Medicine; Chronic Pain; GI Disorders; Mental Health; Endocrine Disorders; Oncology and Survivorship; Pediatrics; Cardiovascular Disorders; Women’s Health; Men's Health; and Ethical and Legal Considerations.